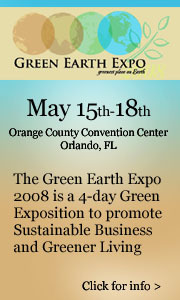 The Green Earth Expo, May 15-18, 2008, at Orlando’s Orange County Convention Center, will be the largest show of its kind. Green Earth Expo allows hundreds of Green and Sustainable corporations and non-profits to showcase their Green initiatives to other businesses and consumers. Slated as the “World’s largest sustainable commerce and lifestyle trade show event, the Expo will feature major automakers, alternative energy providers, green construction fabricators and contractors, Green service providers, energy efficient appliance manufacturers, as well as health & wellness groups and organic retailers. Confirmed speakers include top level government officials, Green business leaders, and environmental experts. The Green Earth Expo 2008 will be held from May 15-18, 2008, and is booked for the next ten years. The Orange County Convention Center is the second largest convention center in the U.S., and is the only one to earn ISO 14001-2004 certification for environmental management due to their successful recycling program. Additionally, OCCC recently announced a major solar energy project to provide power to the convention center. The Expo is designed to promote Green and Sustainable commerce. Participating organizations will enjoy a day for the Green Business Summit, and Business-to-Business trade show on Thursday, May 15. The general public will be welcomed for the last three days of the Expo, enabling exhibitors to showcase their Green initiatives to tens of thousands of consumer, business, and government attendees. Global Green Alliance is a consortium of organizations dedicated to promoting Green and Sustainable commerce and lifestyle. Along with producing the Green Earth Expo, GGA works with governments, businesses, and non-profit organizations to raise environmental awareness and to advance Green and Sustainable practices. For more information, please visit www.globalgreenalliance.com.